Learning to self-feed is an important step in a baby's development and Munchkin is the perfect partner for this milestone! 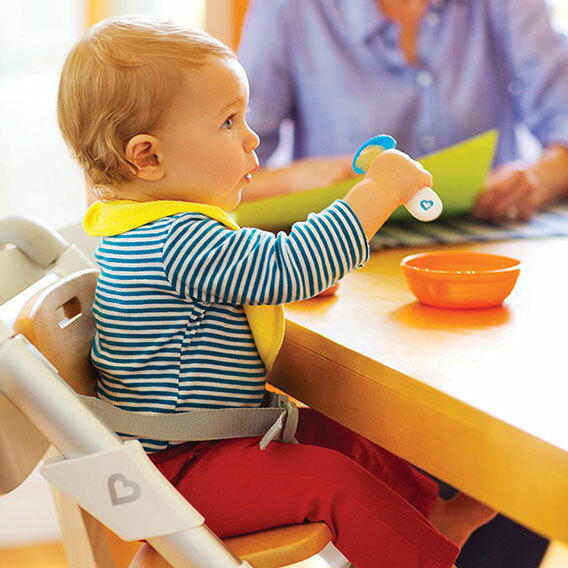 Scooper™ Spoon is designed for baby's natural instinct to self-feed by grabbing the handle and eating in a sideways motion. Gentle, soft plastic works for both right and left handed feedings while baby is developing their preference. We know that teaching your munchkin to self-feed can be a messy endeavor, but the large spoon bowl scoops up more food and keeps it contained which means baby has a better chance of getting it all in their mouth. It's a win-win for parents & baby! Let baby grab the spoon by the handle and dig in!